The road to success is paved with the debris of failure. 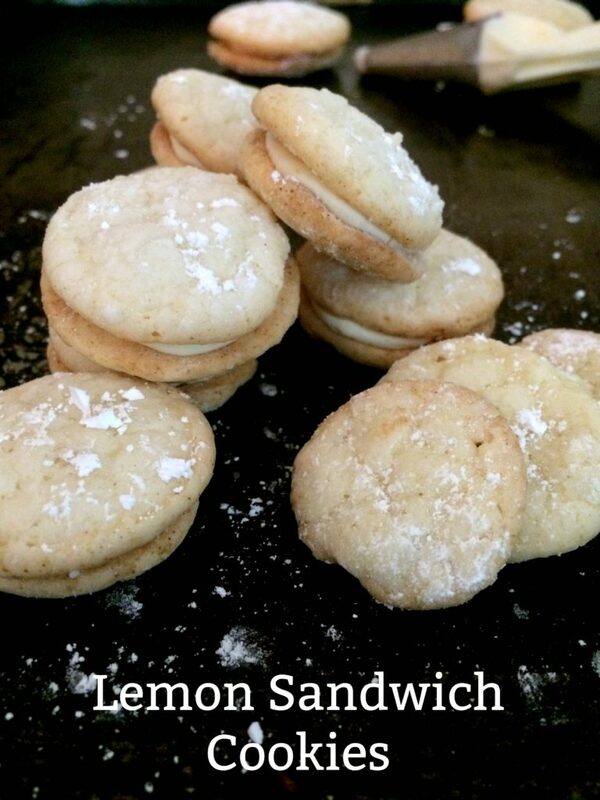 These lemon sandwich cookies are a case in point. Opened a bakery at 23. Returned to college and earned a teaching degree. Began a new career at the age of 41. Traveled for work and pleasure. The secret. Maybe secret is the wrong word. The under-laying catalyst for these achievements has been my attitude: What have I got to lose? Failure is a possible outcome, but so is success. Take my bakery, Baker’s Dozen, for example. With only three years cooking experience, line cooking, I said yes when asked to take over a bakery in Stowe. In time I became a skilled baker, one who could single handedly bake croissants, Danish, French bread, rye bread, brownies, eclairs and Napoleons on most days. This experience provided important personality insights: like my inability to ask for help, basic ineptitude at delegation of tasks, and business is not my strength. Looking back, my baking failures were many: the time I doubled the amount of salt in the bread dough. Being so busy that a huge batch of baguettes over proofed. My naiveté and wishful thinking led to the flattest, saddest and most inedible loaves of bread. But wait there’s more! Un-puffed cream puffs, burnt to a crisp Florentines, cakes with craters. The list goes on. Yet these failures brought knowledge, I never again doubled up on salt. A timer is a helpful mechanism when busy. Keep the oven door open for the last few minutes while baking cream puffs to insure they are dried in the center, yet not over baked. If a cake makes a sizzling noise, it’s not baked through: a quiet cake is a baked cake. Yep, pretty much a disaster. I let the butter get too soft, rolled them out too big and didn’t scrape the bottom of the bowl. BUT they tasted really good. Thank you Fresh April Flours. Undeterred I set forth. Missteps were corrected and improved on. I wanted the flavors to jump a bit more. Candied ginger finely chopped added the missing layer of flavor and texture. After devouring 3, okay 5 of those delicious morsels I thought they could only be improved by adding lemon/ginger cream cheese frosting thus making a lemon sandwich cookie. Ah, the creative process, how I love thee. These little lemony ginger bites were a hit. They’re easy and hey, I’ve made all the mistakes already so you don’t have to. Enjoy! Place dry ingredients in a medium bowl and mix. Place butter, sugar, zest and lemon juice in the bowl of a mixer beat until creamy and fluffy. Add a bit of the flour mixture to the bowl. Mix at low speed. Continue to add flour mixture until incorporated. Add cookie dough to a pastry bag fitted with a round tip. Pipe 1 1/2 inch circles of batter on the parchment paper 4 across, 6 down. Continue until all dough is gone. Pour powdered sugar into a sifter or a handled strainer. Sprinkle the cookies with powdered sugar until coated. Bake cookies in a 350 oven until done. 6-10 minutes. Place cream cheese in the bowl of a mixer and beat until smooth. Add lemon zest and powdered ginger. Mix until incorporated. Slowly add the powdered sugar a little at a time. Beat until smooth. Taste if not sweet enough add more sugar until your level of sweetness is achieved. Place frosting in a pastry bag fitted with round tip. 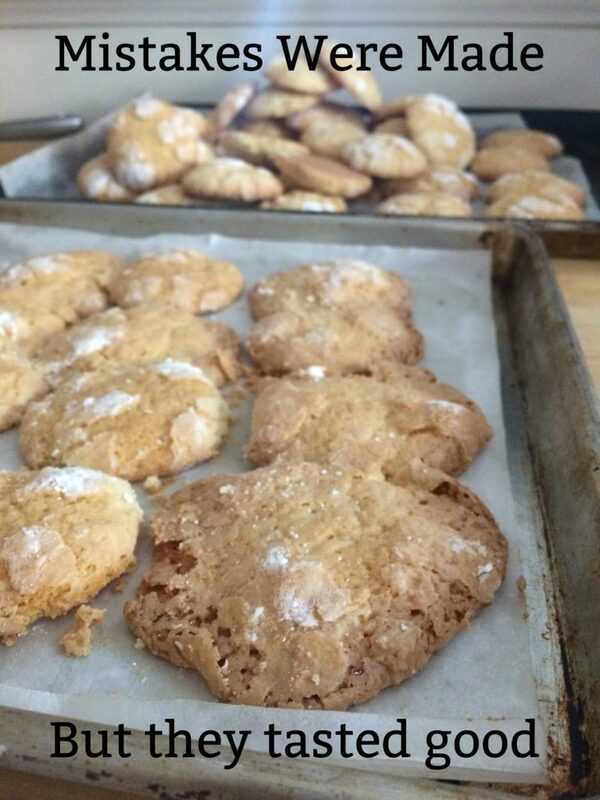 When cookies have cooled, flip one tray of cookies over so that the baked side is facing you. Pipe cream cheese frosting on each cookie. Experiment with how much frosting is needed to fill the cookie. I swirled the frosting so that there was a 1/8 of an inch edge. Place a cookie from the other tray on top of each of the frosted cookies. Press so the frosting is squished to the edge. Continue until you have used all cookies. I loved these cookie sandwichs and I really love the advice about mistakes–gentle forgiveness and learning which you are so great with Judy in all things. Oh yes, we all have our long list of failures at this point in life, but the wisdom that follows makes it all worth it. Happy Birthday Judy, may it be as delicious as your cookies. Love you! The sandwich cookies definitely sound good, and unlike most American recipes, there are no ingredients I don’t understand, so I’m definitely going to give them a try.